Residents of San Antonio, Tx., know Barney Smith as the King of the Commode. 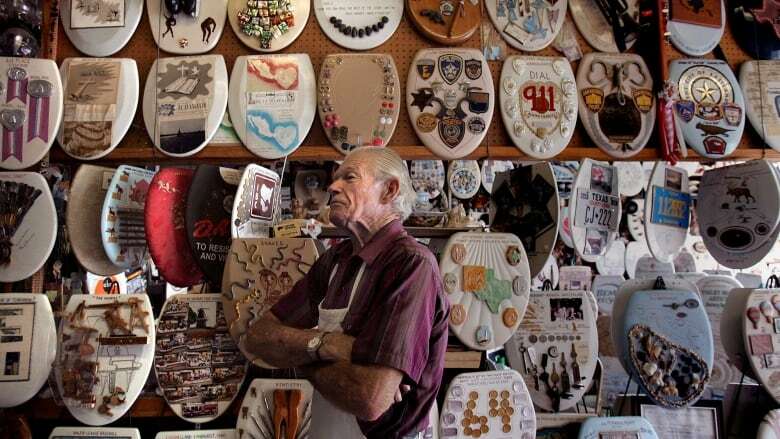 The title is well-earned: the 96-year-old owns the world-famous Toilet Seat Art Museum. You might want to ... take a seat for this one. 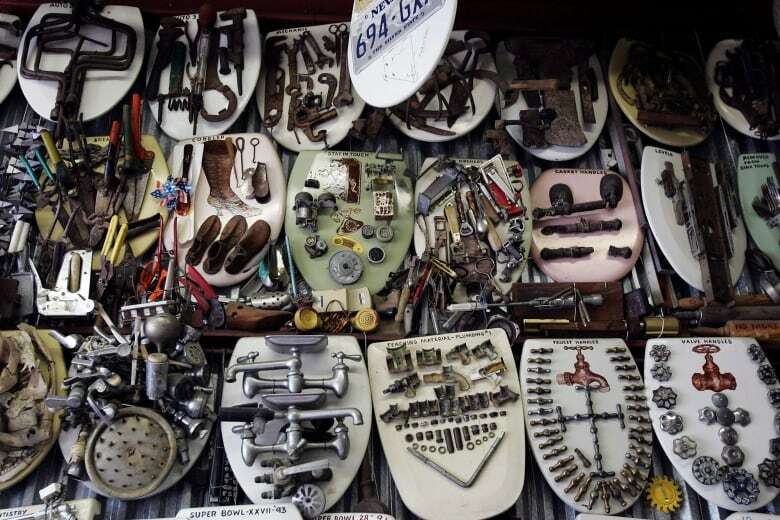 The by-appointment-only museum is really his garage, lined wall-to-wall with toilet seats decorated with paintings, photographs and all sorts of other objects and knickknacks. But now, Smith has decided it's time to part with his meticulously documented collection of 1,322 artworks. When asked why he's selling his epic collection, Smith bluntly told As It Happens host Carol Off: "Because I'm 96 years old and I'm gettin' ready to leave this whole world." The retired master plumber, electrician and minister has been decorating seats for over 50 years, and opened the garage for visitors in the 1990s. a seat adorned with lines from a Rudyard Kipling poem. a seat decorated with a portrait of Judy Garland as Dorothy in The Wizard of Oz. a seat covered in Pokemon trading cards. He also has numerous seats to mark visitors from countries and locations around the world, including several that feature license plates from all over North America. He says he has five seats with Canadian license plates, including British Columbia, Alberta and Yukon. Smith documented several of his life's milestones on toilet seats, as though they were illustrated pages from a diary. One depicts his wife when they celebrated their 74th wedding anniversary. Another features a wasps' nest to commemorate the time he was stung on the forehead. Fair warning to anyone interested in buying Smith's collection, however: you probably won't be able to mount one of the seats to your personal porcelain throne for its originally intended function. "You may fall through the toilet if you sit on a plaque — I call them plaques. They're made out of toilet seats, but they've got their hinges off," he said.